Bulgakova, E. A. (2015). Integrirovanie innovatsionnykh metodov obrazovania v sistemu podgotovki arkhitektorov [Integration of innovative educational methods into the system of training of architects]. Elektronnoe obuchenie i distantsionnye tekhnologii v obrazovanii: opyt i perspektivy razvitia, 1, 10-13. Bulgakova, E. A., & Burkin, V. P. (2016). Distantsionnye obrazovatelnye tekhnologii kak innovatsionnyi metod prepodavania arkhitekturnykh distsiplin [Distance educationtechnologies as an innovative method of architectural training]. International journal of scientific research, 8-4(50), 6-8. Bulgakova, E. A., & Meerovich, M. G. (2016). Uchebnoe posobie dlya prepodavatelei vuzov po razrabotke distantsionnykh kursov obuchenia po napravleniyu "Arkhitektura" [University professor’s manual for elaboration of distance learning courses in Architecture. Chronicles of the joint fond of electronic resources “Science and Education”, 5(84), 41. Ilvitskaya, S. V., Petrova, L. V., Bulgakova, E. A., & Koneva, E. V. (2015). 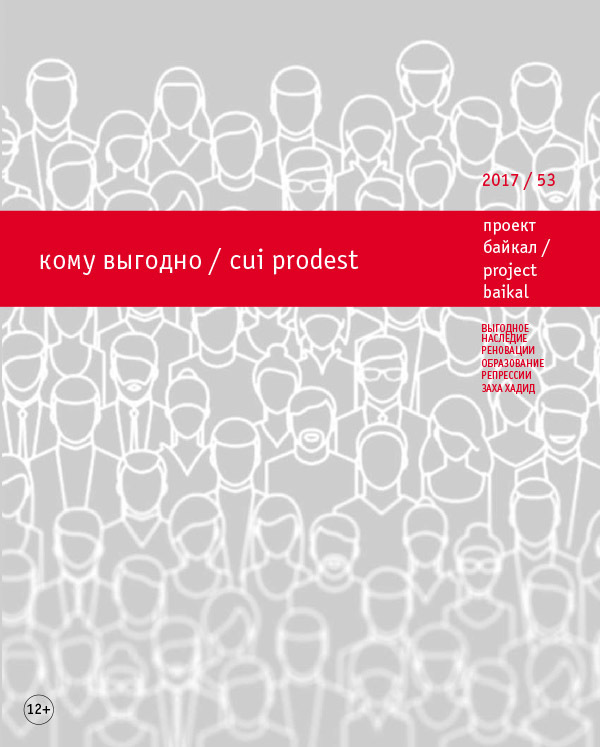 Formirovanie innovatsionnykh kachestv metodiki obuchenia v sisteme podgotovki arkhitektorov [Formation of innovative qualities of the teaching methods in the system of training of architects]. Chronicles of the joint fond of electronic resources “Science and Education”, 8-9(75-76), 58. Petrova, L. V., & Bulgakova, E. A. (2014). Vostrebovannost delovykh igr v tekhnologii interaktivnogo obucheniya arkhitektorov [Demand for business games in the technology of interactive architectural education]. Rossiisky nauchnyi zhurnal, 4(42). BULGAKOVA, Elena. Moscow Information and Technological University – Moscow Architecture and Construction Institute Is an Innovative Architectural School. project baikal, Russian Federation, n. 53, p. 54-57, sep. 2017. ISSN 2309-3072. Available at: <http://projectbaikal.com/index.php/pb/article/view/1212>. Date accessed: 24 apr. 2019. doi: https://doi.org/10.7480/projectbaikal.53.1212.